In a small valley northeast of Istanbul’s Beykoz district lies an old factory complex formerly owned by Paşabahçe, Turkey’s famous glassware brand. 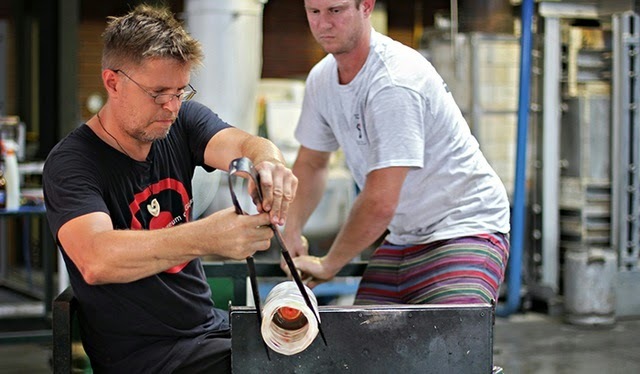 When the company moved their glass cutting business elsewhere, the factory’s halls and workshops lay empty until Yılmaz Yalçınkaya, an avid collector of glass art from all over the world, bought the whole estate to turn the old factory into a haven for aspiring glass workers, artists, and artisanal masters. In 2002 Cam Ocağı Vakfı (Glass Furnace Foundation) opened its creaking industrial metal doors to the public. Since then, much has happened inside and outside the complex. The central hall has been turned into a serene community space with comfortable seating, a large pond full of marvelous glass sculptures, and large windows to shine a light on the brick and iron dominated interiors. Dormitories for visiting students and artists, an outside pool, a workshop center and a conference room have been built, as well as a small pier for easy access to the river that marks the lower end of the vast green compound.